Heeren Brothers Produce Chooses Enviro-Flo II – Case Study - Jay R. Smith MFG Co. 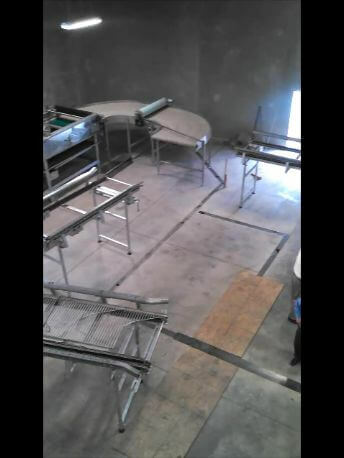 When Michigan based Heeren Brothers Produce decided they needed a bigger facility for their produce distribution and their packing arm, Ridgeking Apple Packing, they turned to Jay R. Smith Mfg. Co. for help. As you can imagine, there would be hundreds of gallons of water flowing through the new 178,000 square foot facility as part of daily cleaning of the facility along with the washing and rinsing of the produce. It was clear from the beginning that drainage expertise and hands on assistance would be needed for a job of this magnitude. Wholesaler Etna Supply turned to Smith’s Representative, Diversified Spec Sales, Inc. for advice. Several meetings ensued with the contractor and Etna Supply to explain how the new Enviro-Flo II trench drain system could adapt to this job’s loading and fall conditions. It was a true team effort with the trench drain group at Smith drawing the complete job layout to scale to accommodate the footprint and offer adequate drainage around the processing equipment – a total of 1,600 feet of trench drain. Working off that blue print of the entire building with every piece of trench run numbered and labeled, Jay R. Smith Mfg. Co. started the process of filling the order. While many sections of the Enviro-Flo II were standard, several 45 and 90 degree angle pieces were custom manufactured. Next, each physical piece of trench drain was numbered corresponding to the layout on the blue prints. It was then packaged onto skids pre-numbered and marked based on the areas they were to be installed. This extra attention to detail allowed the contractor to have each skid placed in the exact location it was needed. The job had an aggressive schedule and the detailed labeling and tags helped speed up the installation. However, sandy soil conditions on this job prevented the contractor from using the Rante-Arrow Mounting System. The design of the Enviro-Flo II adapted easily to the contractor’s own unique mounting system. Installers were able to use threaded rod cut to length, and then driven into the ground until they hit something solid. In some areas, that distance was up to eighteen inches. 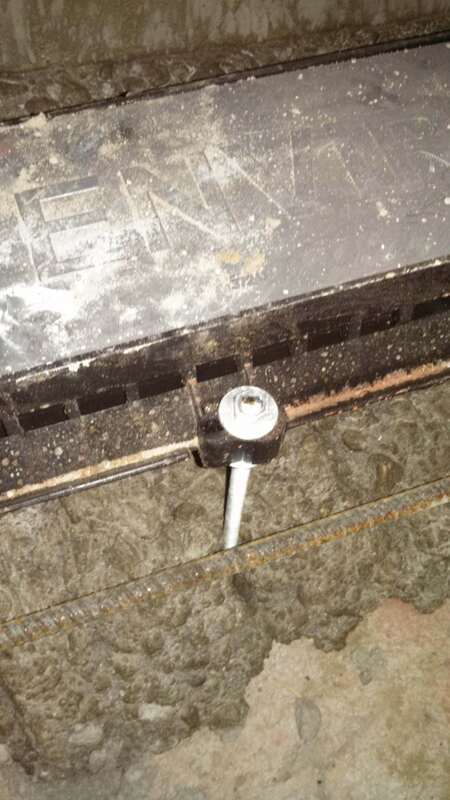 The contractor could then fine-tune each section using washers and nuts on the rod to make the drains level. At one point during installation, the contractor discovered that one of the reference points had moved on the actual drawing furnished by the engineer. As a result, the contractor had to make changes to some of the sections of trench drain on the fly. Because the material of the Enviro-Flo II is so lightweight and easy to work with, they simply cut each section to fit with a handsaw. This simple solution allowed them to keep moving without any delay. The next step in the project was the concrete pour. Typically your average trench drains want to float, but with the Enviro-Flo II system the contractors were able to hold them in place with the threaded rods. Then, a footing was poured under the trench drains just to set the rods. Once set they could come back and do a regular pour for the whole slab. Burgess Concrete Construction was impressed. For a job like this, they use big cement spreaders that cut an eight-foot path. With the Enviro-Flo II’s factory furnished recycled board insert and high quality environmentally friendly materials, they could drive the spreaders right over the drains saving time and no worries about damage caused by the heavy equipment. In the end, everyone was happy with the results and duly impressed with how easy the Enviro-Flo II was to work with. Furthermore, the distributor-rep-factory team assisted along the way and helped the contractor perform without any delays or problems. If you have a job that requires a trench drain system, whether it’s the same scale as the Heeren Brothers job or a more straightforward project, take a look at the Enviro-Flo II. To find a rep near you, go to our “Contact” page. To see just how easy the Enviro-Flo II is to install, view the below videos featuring the installation of the Enviro-Flo II trench drain system on Hometime TV.